Great Beers and Great People! A Pirate Red Ale served on Nitro in honor of Grace O'Malley, the "Pirate Queen of Connacht." A traditional ale brewed with Rye. A satisfying brown ale for winter while we wait for Persephone's return. A wild IPA for daredevils who work without a parachute. 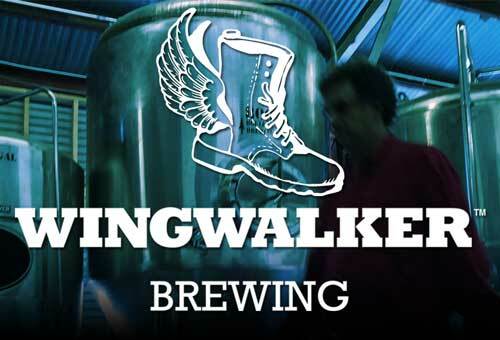 At Wingwalker Brewing, we celebrate the Daredevil Barnstormers of the past and the Spirit of Adventure that drove them. The same bravery (or foolhardiness!) that makes it possible to climb out of an airplane cockpit and play a game of tennis on the wings inspires our explorations of beer. We do not fly the straight and narrow-we loop and we spin; we do not color inside the lines- we make our own picture on the page, and if you say it can’t be done- THAT’S A DARE! We also know that there is a time to stop the adventures: a time to relax and just enjoy a delicious beverage to wind down at the end of the day with friends and family. So in addition to our bold and daring brews, we offer quiet and soothing beers for those times when the thirst for adventure is satisfied, but the other thirst has not quite been quenched. We are pleased to announce the opening of Wingwalker Brewery and Taproom in Monrovia, California. Come on down and soar! Here at Wingwalker we make every possible effort “Reduce, Reuse, Recycle, Re-Mode”: We choose the finest quality sustainably grown hops, malts and grains; all of our spent grain is repurposed for bakeries, dog treats, and animal feed; all of our organic waste is composted.